1. Using a vegetable peeler, remove the zest from one of the oranges. Cut the peel into very thin strips, then roughly chop and set aside. Squeeze the peeled orange and one other to give about 175ml of juice. 2. In a small pan mix the orange juice and zest with the caster sugar and 75ml of cold water. Simmer gently for 5 minutes until the sugar dissolves. Increase the heat and boil for 3-5 minutes until thickened and syrupy. Set aside to cool then cover and put in the fridge until needed. 3. Finely grate the zest and squeeze the juice from the remaining oranges and the lime. Add to a large bowl with the icing sugar. Stir to dissolve the sugar then add the cream. Using an electric whisk beat until forming soft peaks. Pour into a shallow 3-litre freezer-proof container. 4. Cover and freeze for 1 hour, until just becoming firm. Beat well until smooth. Repeat the freezing and beating once more, then fold in half of the shortbread. Drizzle over the cooled syrup and swirl through to ripple. Scatter over the remaining shortbread. 5. Return to the freezer for 2-3 hours until completely firm. When ready to serve, remove the ice cream and leave to stand for 10-15 minutes before scooping. 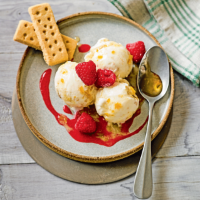 Delicious served with raspberries, raspberry coulis and extra shortbread.